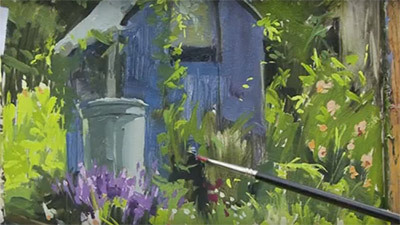 In this film Bob takes us through many of the elements of watercolour painting, working on simple studio demonstrations that are then fully explained in on-site paintings. Tonal values, colour mixing, glazes, wet into wet, skies, figures and more are all covered in a fun, simple manner. Filmed in Australia, Bob's subjects include the courtyard fountain outside his studio as well as the wonderful scenery of the Mornington Peninsula near Melbourne. 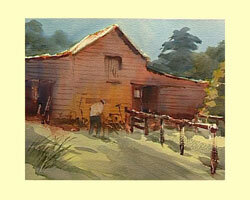 Here he paints two views of a barn, creating a different mood in each. At the point of the peninsula he paints several views on a divided sheet of paper, and he paints rock formations on the surf beach at Gunnammatta. 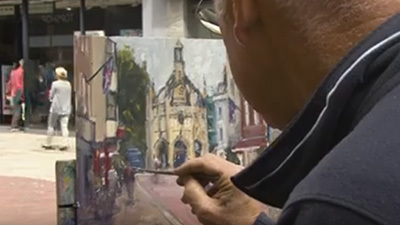 I have recently had the pleasure of working with Robert Wade, so I was delighted to receive his latest video to review, and to have the opportunity of seeing exactly how he creates his outstanding paintings. 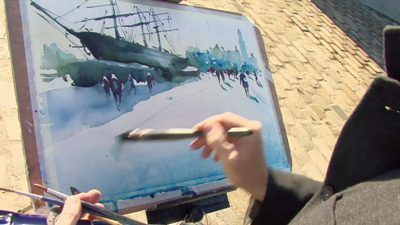 Robert Wade�s Watercolour Workshop is Robert's third film, and puts on record the teaching methods that have earned him an international reputation. An inexhaustible traveller, he has painted and run workshops across the world. In his considered and personable manner, Robert presents a teaching programme that works from simple demonstrations in the studio to larger paintings, either worked on location or from further reference indoors. He works freely, taking some of the mystique and fear out of the medium, and showing how to produce glorious wet-in-wet glazes that can create rich atmosphere. I particularly like the way he uses divided sheets. When working on location he divides his paper into a number of smaller areas with masking tape. By the end of the painting session he has a collection of paintings around the same theme, in the manner of a sketchbook. When seen side-by-side, each one informs the other, pulling out details, or showing a different view. They provide brilliant reference for future paintings and are beautiful in their own right. Robert considers drawing to be of great importance for developing visual skills, for reference, and as the basis for finished paintings. He dips into his sketchbook to show the kind of thing he documents whilst on his travels landscapes and towns capes, figures and markets etc. Again, these are beautiful things, and I marvelled at the stylish notes that accompanied them. Filmed in his native Australia, the scenery is spectacular. On a grey day in the UK, I turned green with envy as I watched him paint a beautiful fountain in the lush sunny courtyard outside his studio, and then the craggy basalt rocks of Cape Schanck, and the dramatic rocky beach at Gunnamatta, both on Victoria's Mornington Peninsula. 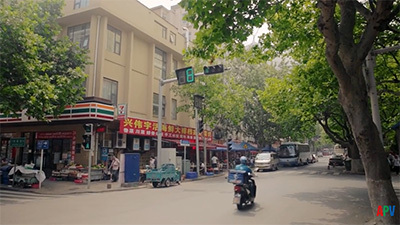 This film is packed with useful guidance on a wide variety of subjects. Artists of every level of experience would find it stimulating. 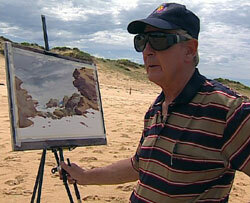 Robert is one of Australia's greatest living watercolour painters, a great teacher and a joy to watch. 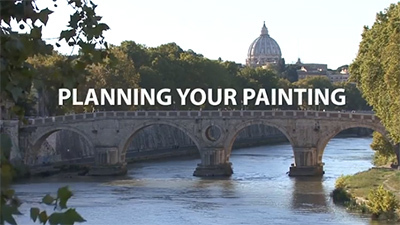 There is always plenty of choice when it comes to new videos on watercolour painting, but Robert Wade's latest film Watercolour Workshop should not be missed. 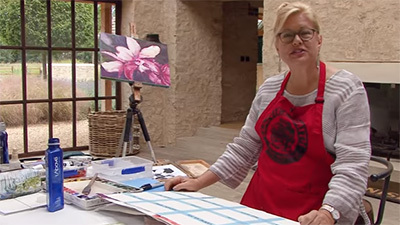 Numerous artists worldwide have benefited from Bob's lively and instructive watercolour workshops and in this wonderful film, which was shot at various locations in Southern Australia. 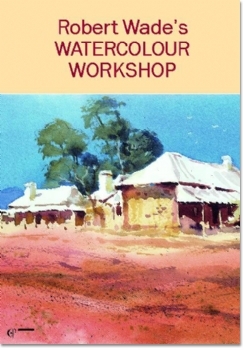 We are treated to an intensive, enjoyable and thoroughly absorbing 90-minute compilation of the important aspects of watercolour painting which this distinguished artist has covered in his workshops over the past 20 years. He begins with advice and simple studio demonstrations relating to two key elements: tonal values and colour mixing. We learn to consider "am I light enough, am I dark enough" all the while we are painting and, with a palette of nine colours, just what variety and at the same time unity of colour can be achieved. These points are put into practice in the first demonstration. of the courtyard fountain outside his studio, in which he also introduces us to his wet-in-wet glazing technique. Other demonstrations cover how to create an "infusion of colour" in a subject; "the faster the better" skies; sketchbook drawing; location studies on a divided sheet, figures and landscapes. 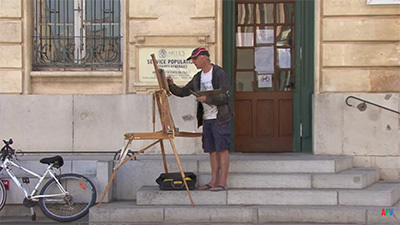 Throughout the film we are encouraged to "paint it as it feels rather than how it looks". Finally Bob comments: "I hope you are going to get a great deal of benefit from the suggestions I've made." Who could fail to? There is more watercolour wisdom in Robert Wade's absorbing 90-minute film in which he focuses on the key features of the medium, as covered in his many successful workshops over the past 20 years. He begins in the studio with some useful exercises relating to tonal values and colour mixing, and these are followed by a number of fine demonstrations in paintings covering a variety of techniques and effects: wet-in-wet; creating "an infusion of colour; fast and loose skies; sketchbook drawing; location studies on a large, divided sheet of paper; and figures and landscapes. The message throughout Watercolour Workshop is "paint it as it feels rather than how it looks". Robert Wade is a master watercolourist and a fine tutor. He shares his decades of experience in a way that is easily understood and encourages by example.